My older brothers are the originators of this recipe, and I just perfected it. :) One year, after girls camp, we had lots of BBQ Chicken left-overs. My brothers, being typical starving boys, combined whatever they could find in the fridge, to make a suitable meal. This meant a baked potato, BBQ chicken, cheese and hot sauce. They let me try it and I fell in love with it! Now it’s something I’ve been making for years! (Note: My alteration was just changing the potatoes from a baked potato to the crispy potato cubes or french fries. Both are yummy). In a crock pot, combine chicken breasts and BBQ sauce. Add enough water to cover chicken. Cook on low for 4-6 hours, or until chicken is cooked. (This can also be done quickly by simmering the chicken in BBQ sauce and water on the stove.). When chicken is cooked, cut into strips and return to the sauce. Wash, puncture and cook potatoes (oven baking or microwave baking both work). Cut the potatoes into 1″ cubes. Heat oil (or butter) in a large frying pan or wok, over medium-high heat. Add potatoes and fry until golden brown. Add salt, garlic powder and Cayenne. If you are using french fries instead of whole potatoes, top them with the same seasonings and bake them according to the directions on the package. 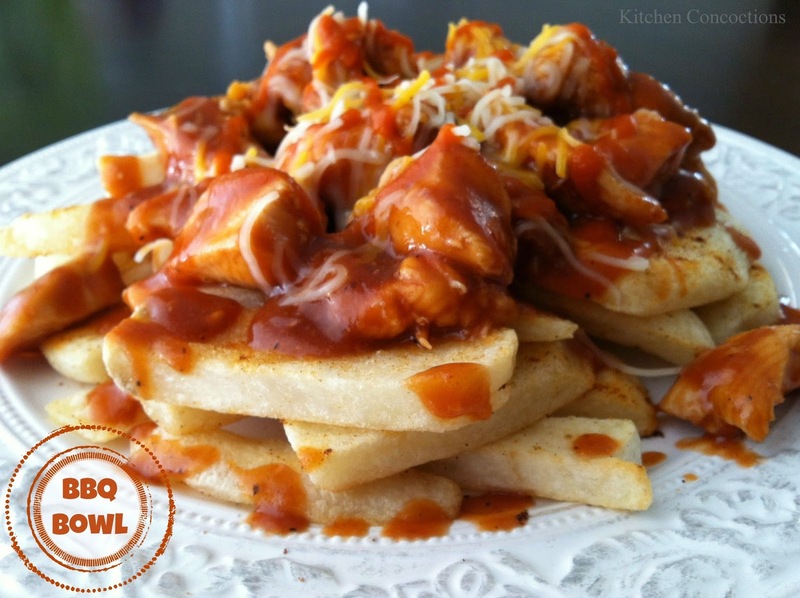 Serve the pan-fried potatoes (or fries) topped with chicken strips, BBQ sauce, cheese and hot sauce. Makes about 4 servings…. if you feel like sharing.